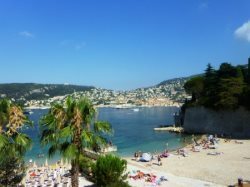 Travel Tips for your vacation on the French Riviera ! Travel Tips for an easy vacation on the French Riviera. Different culture, different habits ! In general, all the shops, museums, open at 9.00 am except for shopping centers, or busy city centre shopping area who usually open at 10.00 am and go non stop until 7.00 pm, almost everything is in France from 12.00 pm to minimum 2 pm. Sometimes 3 pm. Sundays : Almost everything is closed on Sundays. Some grocery stores open in the morning until 12.00 but not all of them. Bakeries, food in general is open in the morning too. Buses and train run on Sundays, but at a lower frequency. GMT +1 (+2 in British summertime). Money Euro (€) is the currency. Visas Each country has its own regulations and restrictions for its visitors. Find specific visa information for your destination. Health Travelling to (sub) tropical destinations means taking care of your health. Read more about health issues for the area you're visiting. Electricity 220-230V AC, 50 Hz, two-pin plugs are standard. Dialling Code +33 (national), (0) + 1-digit code + 8-figure number. There are cybercafes around train stations and in the centre of cities like Nice, Cannes and Monaco. In small towns, the tourist office can point you in the right direction. National holidays in France. Usually Museums are closed, and shops might be too. The Nice airport has two terminals. Terminal 1 is for international flights, and Terminal 2 is for European and internal French flights. (except for Air France or Delta direct flights from New York arriving and departing from Terminal 2) A free shuttle-bus provides service between the two terminals and the parking lots. The shuttle-bus runs every 8 minutes during peak hours and every 15 minutes at other times. * Prices around 60 euros to Cannes or Monaco. Restaurants have eccentric opening hours but it's sure that you won't get lunch before noon or after 2pm and dinner runs from 7.30 to about 10pm. It's wise to call restaurants in advance to check on the hours. What to pack for a vacation on the French Riviera ? Never forget that on the French Riviera you go up and down hills all the time. You can go from sea level with a mild temperature to the mountains ! So layers are what we suggest ! French people don't dress up for lunch, and usually you don't need to dress formal to go out for dinner at night, unless specified by the restaurant. To many of you, French Riviera weather will not be cold in November. But still, it can be a little wet, and you need some confortable warm clothes to tour ! The wind is not your friend, even though we do not get very cold. Snow is the exception here. But still warm coats, hats, gloves, warm sweaters will keep you confortable while you visit the Riviera, as most, but not everything is outside ! As ski resorts are only 1.30 hours away from the coast, with a pair of jeans, kneehighs, and hat and gloves, you can go skying ! All you need can be rented in all the ski resorts. The sun sure makes the difference and temperatures can be high if you lay in the sun. But don't forget the french saying : En Avril ne te decouvre pas d'un fil !" In April, don't think it's summer already and stay covered ! Nights can be chilli, and you will go from cold in the morning, to a little warmer during the day, and cold again at night. Summer can be very hot ! But if you are by the sea at night, with the brise, he can be a little chilli sometimes. And again, if you are travelling up to the mountains, you can use a sweater. The second part of august sometimes gets some rainy days. Every town or village usually has it's own market. Markets are usually on different days. Every Saturday from 8 a.m. to 1 p.m., at the "Octroi" Square and in François Binon's garden (Octroi). Every Sunday (all day), professional seconhand dealers organize a market on Amélie Pollonais Square (Port de la Santé) and in François Binon's garden (Octroi). Every wednesday morning, from 8.00am to 1.00pm. Everyday, from 7.30am to noon. On Friday morning, from 7.30 am to noon. With the Villefranche shopkeepers ! Come and discover on Place Amélie Pollonnais a wide range of products, offered by the Villefranche shopkeepers. Some 20 of them have stalls where you are always welcome to look over their wears and merchandise; every Wednesday, Thursday, Friday and Saturday from 9.am to 7.pm Place Amélie Pollonnais. Flower Market, Cours Saleya, runs 6 a.m.-5:30 p.m. Tuesday, Thursday and Friday, 6 a.m.-6:30 p.m. Wednesday and Saturday, and 6 a.m. to 1:30 p.m. Sundays and holidays. Fruit & Vegetable Market, Cours Saleya, runs 6 a.m. to 1:30 p.m. every day but Monday. Antiques Market, Cours Saleya, runs 7:30 a.m. to 6 p.m. on Mondays (unless they are holidays or the eve of holidays). Arts & Crafts Market, Cours Saleya, from Jume 1 to Sept. 30, every day from 6 p.m. to midnight. Fish Market, Place Saint-Francois, 6 a.m. to 1 p.m. every day but Monday. Used & Antique Book Market, Place du Palais, first and third Saturday of the month, 8 a.m. to 6 p.m.
Arts & Crafts Market, Place de Palais, second Saturday of the month, 8 a.m. to 6 p.m. Antique Postcard Market, Place de Palais, fourth Saturday of the month, 8 a.m. to 6 p.m. If that doesn't satisfy your desire for markets, here is a list of other markets that operate throughout Nice. Each operates every day but Monday from 6 a.m. to 1:30. Happy market-browsing. I wish you many great finds!